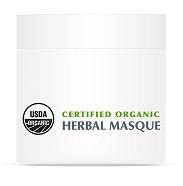 Organic Herbal Masque moisturizes, calms, and relaxes the skin. Richly nourishing and helps promote the skin's natural moisture. Restores fatigued and stressed skin to a radiant, fresh, and younger look and feel. Directions: Apply over clean face and neck areas for 10 to 15 minutes. Rinse with warm water. USDA, CCOF, OASIS and NSF certified organic. Organic NDRÂ® XC Antioxidant is specially formulated to help skin rejuvenation. Helps restore skin damaged by UV rays and free radicals while dramatically improving skin texture. Facial contours will appear tighter and more defined, as fine and moderate wrinkles are diminished. Directions: Apply small amount over clean facial area and around deep lines. USDA, CCOF, OASIS and NSF certified organic. Organic Glycoforte P.M. facial treatment is formulated to treat rough, damaged, and prematurely aged skin. Helps exfoliate dead cells. Rejuvenates, revives and smoothes the skin. Organic Eye Concentrate is a unique formulation designed to treat the eye area with the most nourishing and balancing natural ingredients. It promotes skin moisture and prevents premature sun aging. Directions: Use morning and night after thorough cleansing. USDA, CCOF, OASIS and NSF certified organic. Organic C' Lift Antioxidant Serum is rich in botanical extracts and essential oils to increase skin elasticity, lessen appearance of wrinkles and deep lines, and stimulate rejuvenation of facial skin. Skin will appear measurably firmer. Directions: Apply small amount to clean skin and pat gently, concentrating around lip, neck, and eye area. USDA, CCOF, OASIS and NSF certified organic. Organic C+ Nutrient – Antioxidant is a formula developed to help skin rejuvenation. Protects from free radicals and helps to dramatically improve skin texture. Facial contours will appear tighter and more defined, as fine lines and wrinkles begin to disappear. Directions: Apply small amount over clean facial area and around deep lines. USDA, CCOF, OASIS and NSF certified organic. Organic Active Scrub is a special formula designed to treat oily, combination, and problem skin with gentle yet deep exfoliation, cleansing out impurities while nourishing, and toning. Skin will feel and look clean, fresh, and rejuvenated. pH balanced. Directions: Apply small amount to dampened face, and throat, avoiding eye area. Use light circular movements to cleanse. Rinse off with water. USDA, CCOF, OASIS and NSF certified organic. 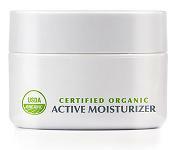 Organic Active Moisturizer is formulated to treat oily to problem skin. It helps restore skin's moisture and keeps it feeling comfortable all day. It is a light-weight and quick-absorbing emulsion with natural hydro-balancing ingredients. Directions: Use in the morning to hydrate normal to oily skin. Apply as needed to thoroughly cleansed face and throat.. USDA, CCOF, OASIS and NSF certified organic.